Wismec IndeReserve RDTA Review - Daily Vaping Deals & The Best Vape Product Reviews at Vaping Cheap! 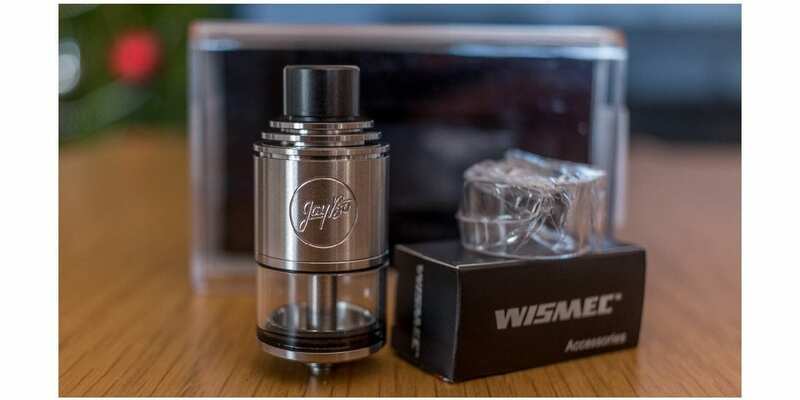 American designer Jaybo and manufacturer Wismec have been a busy little team of late, collaborating on many new vaping devices. We have seen a lot from this partnership, on the vape scene, for quite a while now and they have definitely solidified their position in the market due to their well earned reputation. The newest RDTA from them is called the IndeReserve which is a 25mm tank to rival the likes of the most popular genesis style RDTAs on offer at the moment. We are going to cover my impressions of the tank, how it builds and most importantly how it performs. I’d like to thank GearBest for sending the IndeReserve out to me for the purposes of this article. While there are many similar tanks on the market in this genesis RDTA form, the IndeReserve takes from these what it needed to and has also thrown in some unique features which should make it stand out from the rest. Made from stainless steel, the IndeReserve boasts side e-liquid filling and top airflow control. It is marketed as having an open wicking system, for ease of installing coils, and that all the parts are detachable – making it convenient for cleaning and maintenance. Check out the Wismec IndeReserve RDTA Here! Click Here to Check Out the Wismec IndeReserve RDTA! The packaging for the IndeReserve was over and above most of the tanks on the market today. Instead of coming in a box made entirely out of cardboard, it showed up in a clear plastic case. The tank was sitting very proudly in the middle of the package and I have to say the whole presentation looked great. The spares are neatly packed away into a small box that is placed at the bottom of the case next to the spare glass. There is ample padding around the tank and the rest of the included parts to ensure there is no damage in transit. Everything is safe and secure with this one. When I first saw the tank, I do have to say that it stands out from the other similar tanks in the highly crowded RDTA market. The main reason for this would have to be the shape of the design and the look of the heat sink air fins on the top. We haven’t seen this on any RDTAs to date and I have to say that this makes the IndeReserve stand out from the crowd. It looks very smart, cleverly designed and well put together. Hopefully the heat sinks play their part and manage to keep this bad boy cool as well as look good. On further inspection, once I took it out of the package, it felt nice to hold. It feels solid and not flimsy, which is always a good feeling. It was clean, shiny and most importantly did not smell of machine oil or appear to have any reminiscence still inside the machined parts of the tank. Everything came apart very easily and the threads were smooth and not janky. The build quality appears to be top notch on this one, I was not able to notice any cheap shortcuts of any glaring omissions from this RDTA on further inspection. 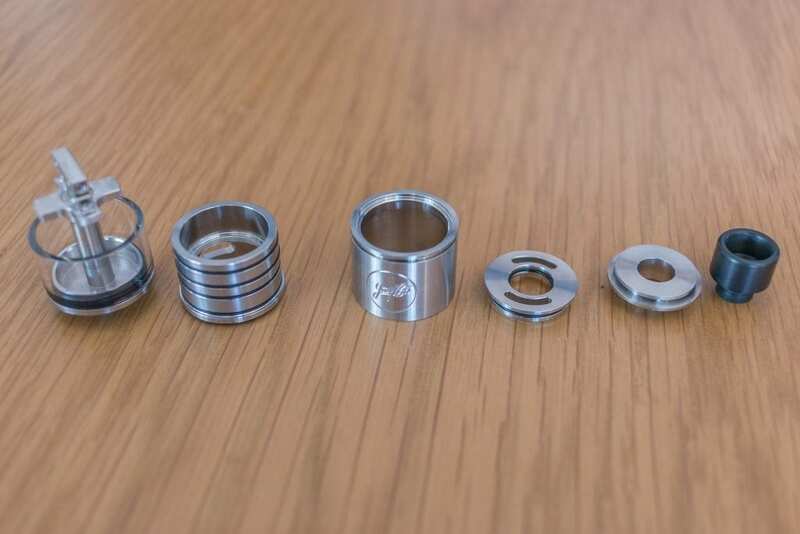 The included delrin driptip is press fitted into the top of the atty without an o-ring, however you can fit your own driptip of choice as long as it’s 510 compatible. I checked a few of mine and they all seem to fit without too much hassle. The IndeReserve is a 25mm diameter tank with a height of 56.5mm and it claims to hold 4.5 ml of e-juice. The deck is in the realm of the velocity style and looks very easy to build on as it strips down nicely to expose the T shaped posts once the base is disassembled. Although the manual indicates that it should come with some form of plug to make it single coil, mine did not. So I cannot comment on how this performs in single coil mode if, in fact, it is designed to do so and not just a mistake in the manual. The collar that screws into the top of the base, over the build deck also houses the side fill area. There is a two part airflow component that locks into the top of the chimney section, and this slides over the collar mentioned previously. The bottom part of the airflow control has 2 kidney shaped holes that sit over each coil and the top part rotates, letting the desired amount of air into the air holes. At this stage the o-rings make good fitment with everything and hold everything snug. More on this to follow. First impressions were very good, now let’s dive down and get up close to see how this thing holds up to some use. The build process on the IndeReserve is a dream, having the build deck fully exposed whilst the tank is apart is such a great feature. Installing your coils into the T shaped velocity style deck is super easy. Simply line them up, center them, tighten down the post screws and trim. I found the best way to wick this tank is to cut your wick a little longer than you think you need. 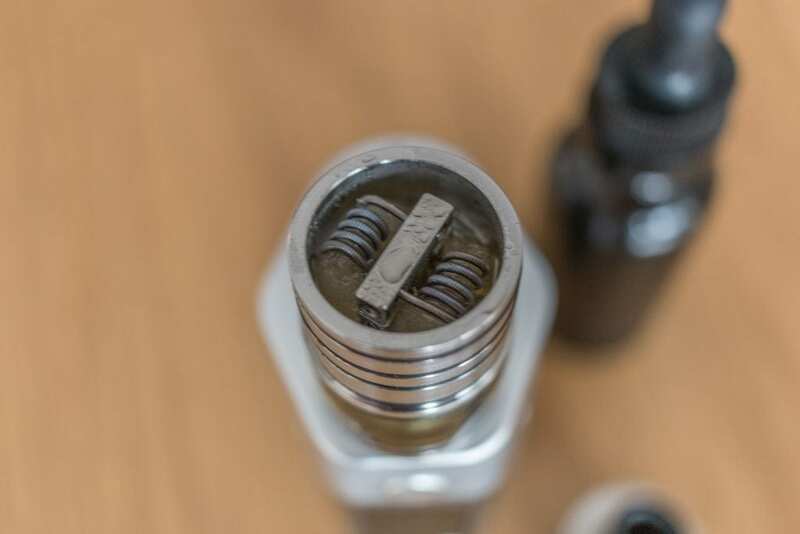 Once you feed the wick through your coils, train them down through the wick slots ensuring that they clear the threads, so they do not get caught up while screwing back together. Saturate them with some juice so they stay in place and cut them so they sit just below the top of the glass. This ensures that you get the maximum amount of juice in the reservoir without having superfluous wick in that precious space and loosing precious space for your juice. The wicks will still soak up the liquid when you tilt the tank to take a vape. I’ve found this to be the best way to wick all of these RDTA style tanks that are currently saturating the market – pardon the pun. Filling the tank is also a breeze. Before you put the top cap on you will find the side fill port ready to accept your juice dropper or bottle tip. I found the best way to fill it is to slightly tilt the tank away from you and the fill port. This way you can see the juice entering the reservoir and you can tell when it’s time to slow down the fill to avoid leakage or back flow form the fill port. Once you have filled the IndeReserve and put the top cap on, it’s time to set the airflow. Make sure you line up the airflow holes with the coils, they need to be directly over the top of each coil. The top airflow is adjusted by simply rotating the very top part of the tank. You can just twist the drip tip as it is held in with enough force to move the top section. Keep in mind that the airflow will keep turning, so you cannot lock it into place. 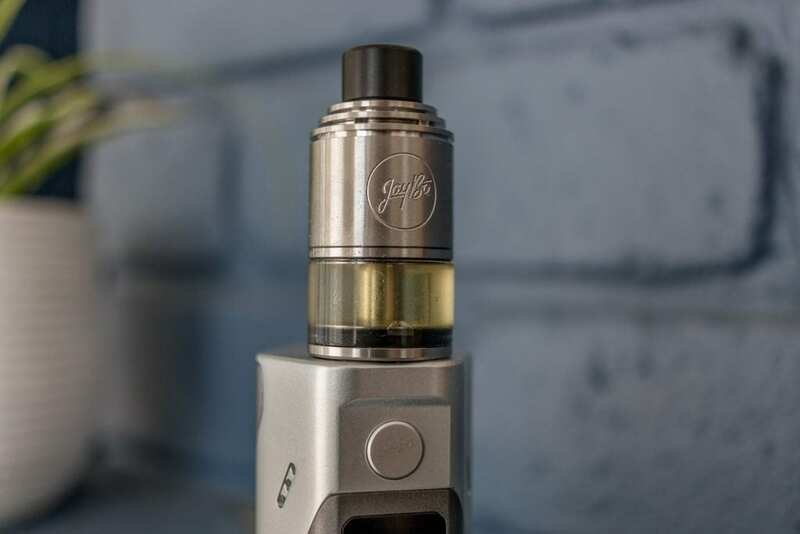 After vaping on this tank for a while and having the top cap on and off for filling, you will start to notice there will be some juice seeping around the o-rings and down onto the body of the tank. This is inevitable due to the design of the IndeReserve, the top cap is pulled and pushed up and down so it takes the juice with it. Make sure you have a tissue or rag handy when filling the tank, not a major issue but one you should be aware of none the less. Speaking of juice on the o-rings, after some use I found them to become very sloppy and failing to make a secure fit. This is probably partly to do with condensation as well. The airflow adjustment gets very loose and will actually come out of place very easily. 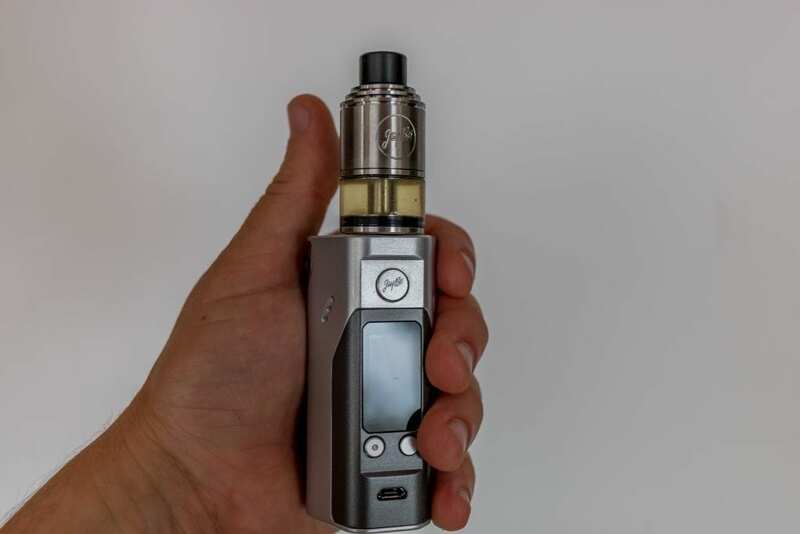 If you pick the tank up by the drip tip the whole top section, including the drip tip, will come off. Or if you hold or pick the tank up from the main section above the glass, it will too slip off without even trying. At this stage I was frustrated with this tank. I like to be able to pick up my mod via the tank, as I store it in my vape bag or pocket sitting upright and can’t always get a hold of the mod to pull it out to take a hit. I was constantly either having the top section come off or the main body coming loose when I tried to take a vape and this was getting very frustrating. Wismec and Jaybo really need to pay more attention to the poor quality here and provide thicker more durable o-rings for this tank. I tested the spare o-rings that came in the spares bag and after the atty heated up a little, they were just as bad. The solution I found for this, was to line the o-ring slots with some dental floss to give them some more girth and provide a better seal. I did this to both o-rings in the two part airflow section and one of the main o-rings on the body of the tank. This is a handy trick to know and can also be used on any tank or RDA that has poor fitting o-rings. I now keep some dental floss in my vape kit as I am sure it will come in handy in the future. Once this modification was done, I was very happy with the performance of this RDTA. Although a consumer shouldn’t have to fiddle with something like this to get satisfactory performance out of an atty, I hope there have been some adjustments made to the type of o-rings included from the manufacturer moving forward. The Included Clapton coils come in at 0.26 ohms and they seem to be pure Kanthal, I’m unsure exactly what gauges were used. The flavor that this build gives through the IndeReserve is full on. I was getting full on flavor and full on vapor production at around 45-50 watts. The fact that the coils sit high in the tank and the top airflow make for a really good concentration of flavor. I found that a slightly closed airflow was best for this build in terms of flavor, but it obviously makes the vape hotter. Those who prefer a hotter vape will be even happier with the airflow closed off more and running a higher wattage. For those who like a cooler vape, you will still get a good dense hit with the airflow opened up to the max or a combination airflow position and running at a lower wattage. I also tried a regular spaced build in stainless steel to give TC mode a whirl on the IndeReserve. It handled TC mode well and would definitely stand up to those who like to vape exclusively in TC mode. The flavor was not quite as good as with the included captions installed, but I am sure it would excel with a Clapton made from TC wire. The way I wicked the tank, I didn’t experience any dry hits or trouble with wicks taking their time to re-saturate. I didn’t get any other leaking than what I mentioned previously. Even when the tank was sitting on it’s side or not in a fully upright position. In no way did the mouthpiece ever get too hot to have an unpleasant experience while vaping this tank. I didn’t see any ohm jumping or check atomizer signals from the mods I tested this with either. The tank looks really good and suits every mod that I tried it on. I was happy that I had the chance to use my own drip tip, however the included tip really works well and I don’t see the need to swap it out unless you really want to. The airflow is more than accommodating for those who like to have a restricted vape or for those who like to have an airy draw. It’s very simple and quick to adjust the airflow on the fly as well, so you can easily change it for every hit if you so desire. The only drawback is that isn’t possible to easily see where the airflow is sitting at any given time. You either need to take a pull through the mouthpiece or physically take it off to see where it is sitting. I prefer to just take a pull and give it a quick nudge if I have to. This would be highly subjective to how you prefer to set your airflow personally. I would have to say that the standout feature for this RDTA from Jaybo and Wismec would be the top airflow, it certainly helps this tank perform better than the flood of other genesis RDTAs currently popular on the market. Most of the other tanks are side airflow, which mean they are fussier about coil placement. I certainly recommend this tank, however I just hope that the o-ring issues are sorted out for future production. Sure, it’s a simple fix, however something that just shouldn’t have to be done out of the box. I can’t fault how the IndeReserve performs in terms of ease of use, flavor and vapor production. It certainly rivals most top RDAs in terms of flavor and looks good to boot. I don’t hesitate to recommend this RDTA to you, I just hope you get one with proper o-rings or are prepared to do a slight modification with some dental floss. I hope this has helped you on your journey through picking your next atomizer. Please don’t hesitate to leave a comment below if you have any questions or something to add.